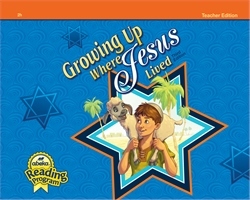 Read along with your students with your own copy of Growing up where Jesus Lived. This hardcover, spiral-bound teacher’s companion includes a copy of the student book with added teaching helps for each story and exercise. Gr. 2. Goals and objectives teach you what to look for as your students read. Your students will learn to read with expression, to observe punctuation, and to read for comprehension. Comprehension/discussion questions help you check that your students are reading for meaning. Character themes, discussion questions and Scripture verses help your students apply the principles and godly character traits found in the story.